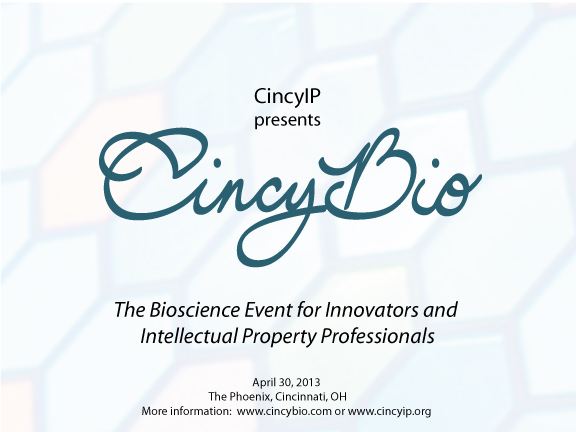 CincyIP is proud to bring back CincyBIO for 2013, Cincinnati’s premier conference on bioscience and technology, for the third straight year on Tuesday, April 30, 2013. 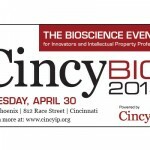 CincyBIO 2013 will be held Tuesday, April 30, 2013 at the Phoenix in downtown Cincinnati. The conference will feature speakers including Tom Irving (Finnegan), Sam Han (McClure, Qualey & Rodack, LLP), Carin Miller (Blue Ribbon Patents), Jeff Weedman (Cintrifuse), James Zimmerman (Taft), David Willbrand (ThompsonHine), Vance VanDrake (Ulmer & Berne), Ralph Hall (University of Minnesota Law School and Faegre Baker Daniels), Dave Bassett (WilmerHale), Pat Lane (Dinsmore), Matt Willenbrink (University of Dayton), Nick Nikolaides (The Procter & Gamble Company), Marie Kerbeshian (Indiana University), Geoffrey Pinski (Office of Entrepreneurial Affairs & Technology, University of Cincinnati), and Chris Fick (Office of Technology Transfer, University of Louisville). This activity has been approved by the Supreme Court of Ohio Commission on Continuing Legal Education for 6.25 total CLE hour(s) instruction. 6.25 CLE hours have also been applied for in Kentucky and Indiana.